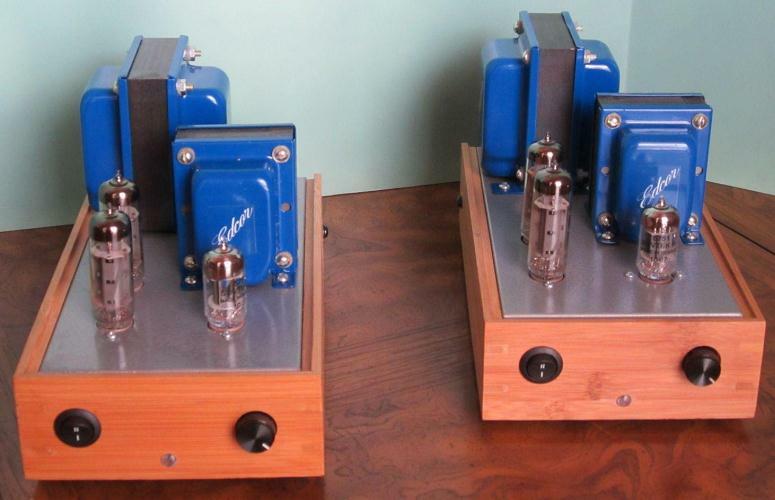 Please feel free to ask any questions and to post comments about the Mini Block Ultra-Linear Class-A Push-Pull EL84 (6BQ5) Valve (Tube) Amplifier Project in this forum thread. I just had a audio DIY gathering this evening (7 guys) and I brought my latest EL84 amp which is also PP UL Class A with a LM317 and the audience really enjoyed it. I had some Edcor 8K, 10W OPT laying around so when I saw your Poddwatt..Bingo ! Why is your B+ at 235V, won't you get more output power if you choose 300Vdc..just wondering because I have also 6W RMS at the output but my B+ is 300Vdc on the plate..(does not make sense to me), if I can lower my B+ my dissipation will be reduced and my tubes will last longer. About the OPT, they appear smaller than the PT so can I assume they are rated 8K or 10K, 15W. I looked at the Edcor site and they are not listed yet. Thanks for making these available to the DIY community, price wise how much do they go for. Hi Iso, I suspect that Edcor will eventually get around to putting the trannies on their site although they don't generally list OEM ones like these. The output transformers are 10K 10 watt ones I had Edcor design to my specs. The power transformers are Edcor also designed for me (EMO 719). The power transformer can be replaced by others that deliver similar voltages, but you really should use the specified output transformers. They make a huge difference in the sound. The use of a relatively low B+ is partly for long tube life and the ready availability of transformers that can provide it. You can get a little more output from higher B+, but the actual audible effect is minimal (audio loudness is not a linear function of power). I had the output trannies designed for use in Poddwatts with their lower B+ and indeed they will be in all future kits. They work well there, but the Poddwatt prototypes with them don't seem to have quite the impact of the minis. So it seemed natural (as much as most things I do) to build some mono blocks with the new outputs to see what they could do. The power transformers really are serious overkill. Half the rating would be fine. They can easily deliver 300ma dc and the amp only needs about 90. The very low impedance of the PS is certainly part of the reason they are and sound more powerful than the previous iteration of the Poddwatt. The bottom end is really exceptional for any small tube amp. It really sounds like about what you would expect a 15-25 watter to sound like. So in a sort of round about way.... yes you can use more B+ on the outputs, but it really isn't necessary. I would however stick to the voltage on the driver tube. If you go higher, safe up to about 300 volts, you will need to adjust the cathode resistors to bring down the current. I would use a 1200R upper resistor and a 1100R and 150R in the bottom. Those values will work and measure well for distortion, but I find the sound cleaner at the lower B+. BTW...not to give away any premature info and not to sound commercial...there is a dual mono version of the Poddwatt in the works that is a lot like two of the minis on a shared chassis with a common set of volume and input selectors. The best of both worlds. No reason at all that you can't diy the same thing, just watch out for spacing of the trannies and other things. Thanks a lot for the detailed answer. first of all thank you for the great work you are doing here. I'm new in Tube Amps DIY and I'm looking forward to build my first one. I choose to start with the Mini Block class-A PP EL84 Amp project as baseline. I have a few questions for you. Unfortunately the shipping costs to Europe from Edcor are quite high so I'm trying to find another provider for the transformers. I found this two on TubeTown (http://www.tube-town.net/ttstore/produc ... Power.html and http://www.tube-town.net/ttstore/index. ... nd-PP.html (1609) ). Do you think they can work? The PT is toroidal and provide 2x150V instead of 2x180V. I guess this is not a big deal. It also provides two secondary windings for the filaments (15V@1A for 5751 and 6.3V@7A for el84). The second questions is about the LR8 voltage regulator. It's kind of hard to find it. Can I simply use a resistor divider (as you did with KT88) to lower the voltage? Hi, Yes you can use a resistor voltage divider like in the earlier projects. The LR8s simplify the design and make it easy to get a predictable voltage on the driver. Also they provide a little additional noise reduction. You will not be likely to hear it, but it does show when I test the amps. The power transformer secondary voltages are not going the best. It will be too high in a single ended mode (with a full wave bridge across the whole winding) and a bit low with a conventional two rectifier arrangement using the CT as ground. The optimum values are either a 200-0-200 or a 200-0. A little more up to about 215 will be ok and a little less down to 180 will be OK. Above that the tubes will be running fairly close to max dissipation and below that the circuit will not be in the best operating range. The Hammond transformers are OK. Either the 8K or 10K 1608 /1609 will be satisfactory. In my experience (I have used those ones) they are not going to be as good as the custom Edcors that were designed for this amp. But the overall sound will still be quite good. Unfortunately I can not find any suitable PT on TubeTown. 200V secondaries have no enough output current (only 100mA). What about two different transformers (http://www.tube-town.net/ttstore/produc ... -30VA.html) used together? Theoretically there shouldn't be any drawback. Do you know any reason to avoid this choice? Hi Antonio, 200 v at 100ma is just enough for the B+. The circuit uses about 90. More would be better. The heater power on the transformer is not enough though you will really need 2 amps at 6 volts there. There is no reason against two trannies - one heater and one B+. I have done that on occasion. Having a single one though makes the build easier. If you can find one with a little higher secondary voltage and current you can always reduce it with resistors in the power filter chain. An alternative is to get one about 50 volts high and use a choke (about 2-5 hy) input filter. That will typically knock off about 50 volts of the B+. A current rating of 150ma on the trannie and at least twice than on the choke is needed. For heaters either about 1.25 amps at 12 vac or 2.5amps at 6vac is the minimum I would use. Hi Everyone, FYI, Edcor has just bundled the two transformers for this project at a discount cost. Check out theie section on project components. Saves a few $$$. Do the 0.1 caps on the heaters as snubbers really make a difference? I ask because I hadnt seen that before yet. Interesting project as well. I have been making guitar amps but am interested in building my own hifi amp as well so I've been looking at projects and certainly appreciate your willingness and time to share yours. Thank you.